San Francisco, CA, 17th May, 2016: Firefox narrowly overtook Microsoft’s combined Internet Explorer (IE) and Edge browsers for the first time globally in April in terms of desktop internet usage, according to independent web analytics company StatCounter. 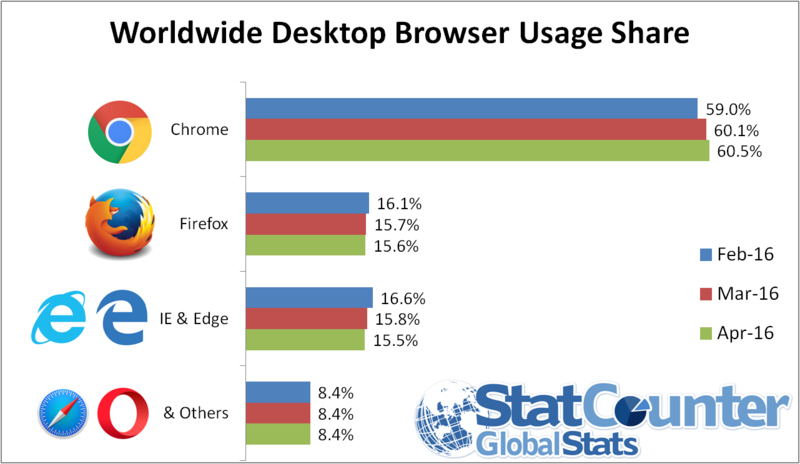 Its analytics arm, StatCounter Global Stats finds that Firefox took 15.6% of worldwide desktop browser usage in April compared to a combined 15.5% for IE and Edge. Google’s Chrome continues to lead the way with 60.5% worldwide. StatCounter data finds that Chrome increased worldwide internet usage from 53% in April last year to 60.5% in 2016 on the desktop and from 44.3% to 47.4% across all platforms. In the US, IE and Edge combined (25.2%) are still ahead of Firefox (13.4%) for desktop internet usage in April. Google Chrome leads on 51.6%. Similarly in the UK, Chrome is leading on 54.2%. IE and Edge combined have 21.8% and Firefox is in third place with 13.2%. StatCounter’s (http://statcounter.com) core business is to provide companies, agencies, bloggers, self-employed and charities with data to measure activity on their website, blog or forum. Key features include a free option, ease of use, independence and ability to view individual visitors in real time.